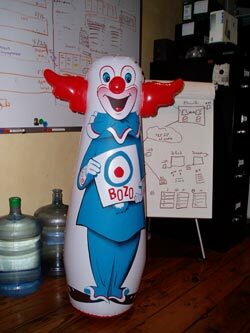 Please meet Bozo, our new VP of Client Relations. We really like him, as Bozo is always there to listen to our frustrations. We can confide in him about late payments, conflicts, and difficult projects. And when things get heated, he takes a punch on the nose quite well. Gets right back up, not a scratch on him, ready for another. We hope Bozo will be with us for a while, however, turnover is high for this position. It’s difficult to stand up to that much pressure without completely deflating a week or two into the job.